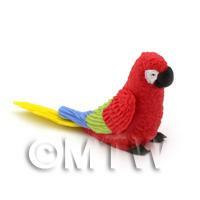 Your Search Results for "Wild Bird"
We found 79 items that matched your search. 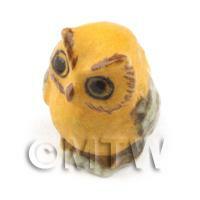 Product ID: 797 A beautiful 1:12th scale yellow owl ideal for any of your outdoor dolls house scenes.Our range of animals are made from high quality ceramic and hand painted to a very high level of detail, giving a very pleasing and unique quality to their finish. 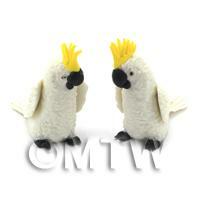 Product ID: 1472 A pair of beautiful miniature white Cockatoos with yellow crests handmade from coloured air dried flexible clay resulting in each bird being slightly different and unique.We have a wide selection of chickens, cockerels and parrots in this range to leave you spoilt for choice. 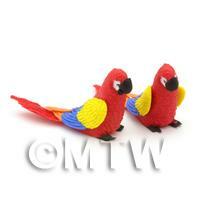 Product ID: 1473 A miniature pair of beautiful red Parrots with yellow, blue and orange wings hand made from coloured air dried flexible clay resulting in each bird being slightly different and unique.We have a wide selection of chickens, cockerels and parrots in this range to leave you spoilt for choice. 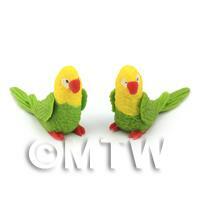 Product ID: 1475 A pair of beautiful miniature green and yellow Parrots hand made from coloured air dried flexible clay resulting in each bird being slightly different and unique.We have a wide selection of chickens, cockerels and parrots in this range to leave you spoilt for choice. 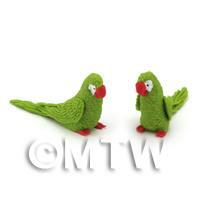 Product ID: 1476 A pair of beautiful miniature green Parrots handmade from coloured air dried flexible clay resulting in each bird being slightly different and unique.We have a wide selection of chickens, cockerels and parrots in this range to leave you spoilt for choice. 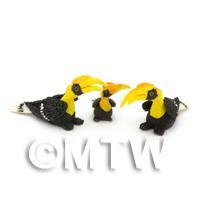 Product ID: 1830 Pair of beautiful miniature yellow necked black Hornbills and a baby handmade from coloured air dried flexible clay resulting in each bird being slightly different and unique.We have a wide selection of chickens, cockerels and parrots in this range to leave you spoilt for choice. 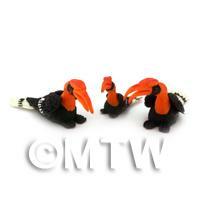 Product ID: 1831 Pair of beautiful miniature orange necked black Hornbills with a baby handmade from coloured air dried flexible clay resulting in each bird being slightly different and unique.We have a wide selection of chickens, cockerels and parrots in this range to leave you spoilt for choice. 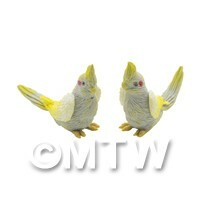 Product ID: 1832 Beautiful miniature grey Cockatoos with yellow crown handmade from coloured air dried flexible clay resulting in each bird being slightly different and unique.We have a wide selection of chickens, cockerels and parrots in this range to leave you spoilt for choice. 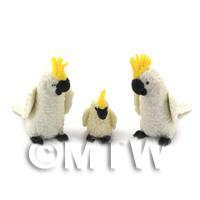 Product ID: 1833 2 beautiful miniature grey Cockatoos with yellow crowns and a baby handmade from coloured air dried flexible clay resulting in each bird being slightly different and unique.We have a wide selection of chickens, cockerels and parrots in this range to leave you spoilt for choice. 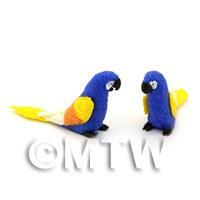 Product ID: 1834 A pair of beautiful miniature blue parrots with yellow, blue and orange wings hand made from coloured air dried flexible clay resulting in each bird being slightly different and unique.We have a wide selection of chickens, cockerels and parrots in this range to leave you spoilt for choice. 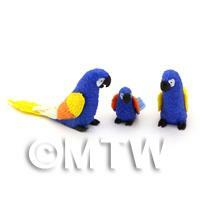 Product ID: 1835 A pair of beautiful miniature blue Parrots with yellow, blue and orange wings and a baby handmade from coloured air dried flexible clay resulting in each bird being slightly different and unique.We have a wide selection of chickens, cockerels and parrots in this range to leave you spoilt for choice. 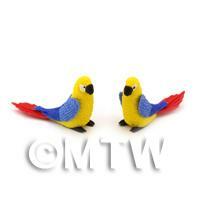 Product ID: 1836 A pair of beautiful miniature yellow parrots with blue wings hand made from coloured air dried flexible clay resulting in each bird being slightly different and unique.We have a wide selection of chickens, cockerels and parrots in this range to leave you spoilt for choice. 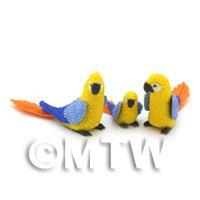 Product ID: 1837 A pair of beautiful miniature yellow parrots with blue and a baby handmade from coloured air dried flexible clay resulting in each bird being slightly different and unique.We have a wide selection of chickens, cockerels and parrots in this range to leave you spoilt for choice. Product ID: 1838 A pair of beautiful miniature green Parrots and baby handmade from coloured air dried flexible clay resulting in each bird being slightly different and unique.We have a wide selection of chickens, cockerels and parrots in this range to leave you spoilt for choice. 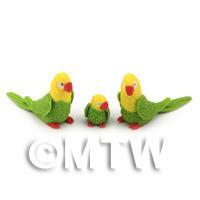 Product ID: 1839 A pair of beautiful miniature green and yellow parrots and baby hand made from coloured air dried flexible clay resulting in each bird being slightly different and unique.We have a wide selection of chickens, cockerels and parrots in this range to leave you spoilt for choice. 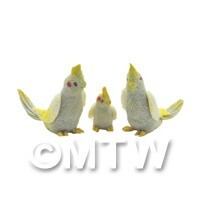 Product ID: 1840 A pair of beautiful miniature white Cockatoos with yellow crown and a baby handmade from coloured air dried flexible clay resulting in each bird being slightly different and unique.We have a wide selection of chickens, cockerels and parrots in this range to leave you spoilt for choice. 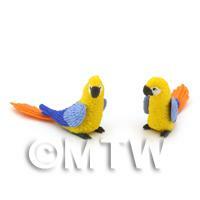 Product ID: 1841 A pair of beautiful miniature yellow Parrots with blue wings hand made from coloured air dried flexible clay resulting in each bird being slightly different and unique.We have a wide selection of chickens, cockerels and parrots in this range to leave you spoilt for choice. 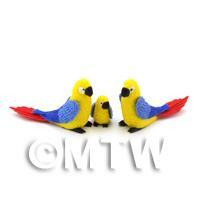 Product ID: 1842 A pair of beautiful miniature yellow parrot with blue wings and a baby handmade from coloured air dried flexible clay resulting in each bird being slightly different and unique.We have a wide selection of chickens, cockerels and parrots in this range to leave you spoilt for choice. 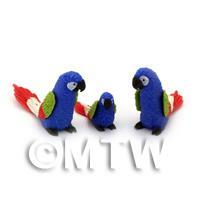 Product ID: 1843 A pair of beautiful miniature blue parrots with green, red and white wings hand made from coloured air dried flexible clay resulting in each bird being slightly different and unique.We have a wide selection of chickens, cockerels and parrots in this range to leave you spoilt for choice. 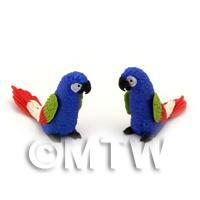 Product ID: 1844 A pair of beautiful miniature blue parrots with green, red and white wings hand made from coloured air dried flexible clay resulting in each bird being slightly different and unique.We have a wide selection of chickens, cockerels and parrots in this range to leave you spoilt for choice. 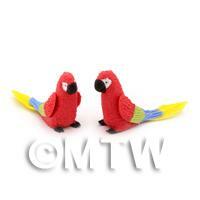 Product ID: 1851 A pair of beautiful miniature red Parrots with red, green and blue wings handmade from coloured air dried flexible clay resulting in each bird being slightly different and unique.We have a wide selection of chickens, cockerels and parrots in this range to leave you spoilt for choice. 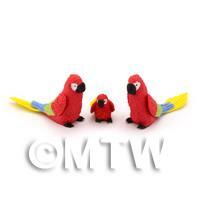 Product ID: 1852 A pair of beautiful miniature red Parrots with red, green and blue wings and a baby handmade from coloured air dried flexible clay resulting in each bird being slightly different and unique.We have a wide selection of chickens, cockerels and parrots in this range to leave you spoilt for choice. 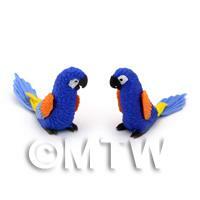 Product ID: 1855 A pair of beautiful miniature blue Parrots with yellow, orange and white wings handmade from coloured air dried flexible clay resulting in each bird being slightly different and unique.We have a wide selection of chickens, cockerels and parrots in this range to leave you spoilt for choice. 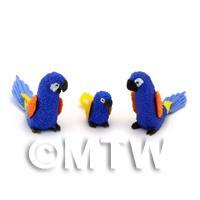 Product ID: 1863 A pair of beautiful miniature blue Parrots with yellow, orange and white wings with a baby handmade from coloured air dried flexible clay resulting in each bird being slightly different and unique.We have a wide selection of chickens, cockerels and parrots in this range to leave you spoilt for choice. 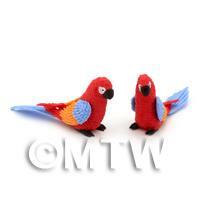 Product ID: 1864 A pair of beautiful miniature red Parrots with blue, orange and red wings handmade from coloured air dried flexible clay resulting in each bird being slightly different and unique.We have a wide selection of chickens, cockerels and parrots in this range to leave you spoilt for choice. 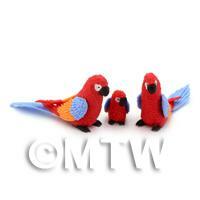 Product ID: 1865 A pair of beautiful miniature red Parrots with blue, orange and red wings and a baby handmade from coloured air dried flexible clay resulting in each bird being slightly different and unique.We have a wide selection of chickens, cockerels and parrots in this range to leave you spoilt for choice. 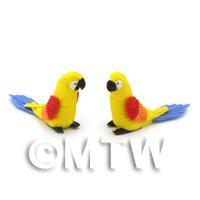 Product ID: 1866 A pair of beautiful minature yellow Parrots with red and orange wings hand made from coloured air dried flexible clay resulting in each bird being slightly different and unique.We have a wide selection of chickens, cockerels and parrots in this range to leave you spoilt for choice. 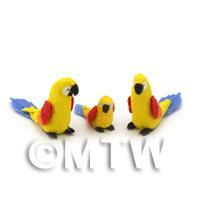 Product ID: 1867 A pair of beautiful miniature yellow parrots with yellow, orange and red wings with a baby handmade from coloured air dried flexible clay resulting in each bird being slightly different and unique.We have a wide selection of chickens, cockerels and parrots in this range to leave you spoilt for choice. 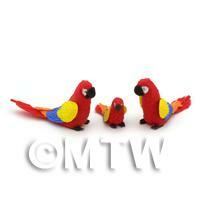 Product ID: 1873 A miniature pair of beautiful adult red Parrots with yellow, blue and orange wings and baby hand made from coloured air dried flexible clay resulting in each bird being slightly different and unique.We have a wide selection of chickens, cockerels and parrots in this range to leave you spoilt for choice. 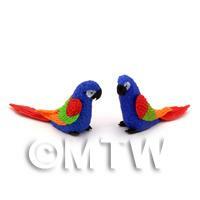 Product ID: 1874 A pair of beautiful miniature blue Parrots with red, green and orange wings handmade from coloured air dried flexible clay resulting in each bird being slightly different and unique.We have a wide selection of chickens, cockerels and parrots in this range to leave you spoilt for choice. 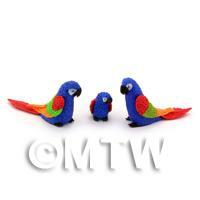 Product ID: 1875 A pair of beautiful miniature blue Parrots with red, green and orange wings and a baby hand made from coloured air dried flexible clay resulting in each bird being slightly different and unique.We have a wide selection of chickens, cockerels and parrots in this range to leave you spoilt for choice. 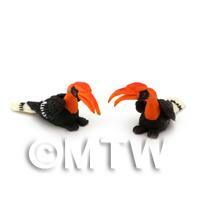 Product ID: 2181 Pair of beautiful miniature orange necked black Hornbills handmade from coloured air dried flexible clay resulting in each bird being slightly different and unique.We have a wide selection of chickens, cockerels and parrots in this range to leave you spoilt for choice. 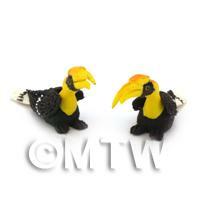 Product ID: 2182 Pair of beautiful miniature yellow necked black Hornbills handmade from coloured air dried flexible clay resulting in each bird being slightly different and unique.We have a wide selection of chickens, cockerels and parrots in this range to leave you spoilt for choice. 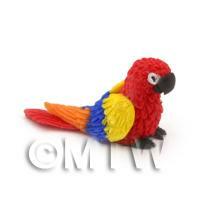 Product ID: 7803 Beautiful miniature red Parrot with yellow, blue and orange wings hand made from coloured air dried flexible clay resulting in each bird being slightly different and unique.We have a wide selection of chickens, cockerels and parrots in this range to leave you spoilt for choice. 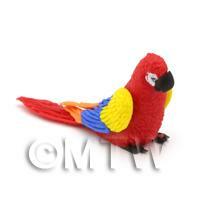 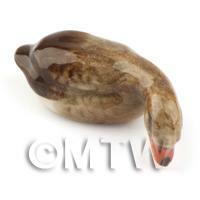 Product ID: 7804 Beautiful miniature red baby Parrot with yellow, blue and orange wings hand made from coloured air dried flexible clay resulting in each bird being slightly different and unique.We have a wide selection of chickens, cockerels and parrots in this range to leave you spoilt for choice. 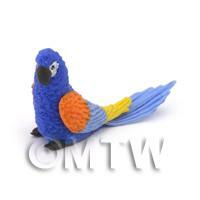 Product ID: 7805 Beautiful miniature blue Parrot with yellow, orange and white wings from coloured air dried flexible clay resulting in each bird being slightly different and unique.We have a wide selection of chickens, cockerels and parrots in this range to leave you spoilt for choice. 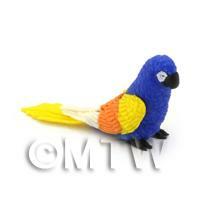 Product ID: 7806 Beautiful miniature baby blue Parrot with yellow, orange and white wings handmade from coloured air dried flexible clay resulting in each bird being slightly different and unique.We have a wide selection of chickens, cockerels and parrots in this range to leave you spoilt for choice. Product ID: 7809 Beautiful green Parrot handmade from coloured air dried flexible clay resulting in each bird being slightly different and unique.We have a wide selection of chickens, cockerels and parrots in this range to leave you spoilt for choice. 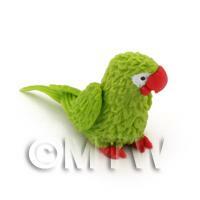 Product ID: 7810 Beautiful miniature green baby parrot handmade from coloured air dried flexible clay resulting in each bird being slightly different and unique.We have a wide selection of chickens, cockerels and parrots in this range to leave you spoilt for choice. 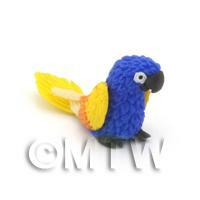 Product ID: 7811 Beautiful miniature blue parrot with yellow, blue and orange wings handmade from coloured air dried flexible clay resulting in each bird being slightly different and unique.We have a wide selection of chickens, cockerels and parrots in this range to leave you spoilt for choice. 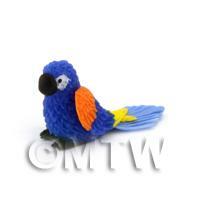 Product ID: 7812 Beautiful miniature blue baby parrot with yellow, blue and orange wings and a baby handmade from coloured air dried flexible clay resulting in each bird being slightly different and unique.We have a wide selection of chickens, cockerels and parrots in this range to leave you spoilt for choice. 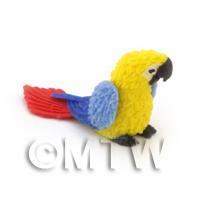 Product ID: 7814 Beautiful miniature yellow baby parrot with blue wings hand made from coloured air dried flexible clay resulting in each bird being slightly different and unique.We have a wide selection of chickens, cockerels and parrots in this range to leave you spoilt for choice. 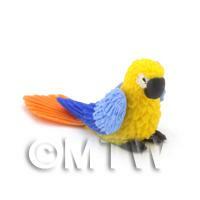 Product ID: 7815 Beautiful miniature yellow parrot with blue wings handmade from coloured air dried flexible clay resulting in each bird being slightly different and unique.We have a wide selection of chickens, cockerels and parrots in this range to leave you spoilt for choice. 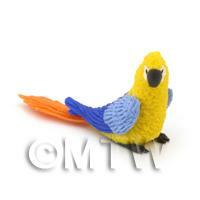 Product ID: 7816 Beautiful miniature yellow parrot with blue wings handmade from coloured air dried flexible clay resulting in each bird being slightly different and unique.We have a wide selection of chickens, cockerels and parrots in this range to leave you spoilt for choice. 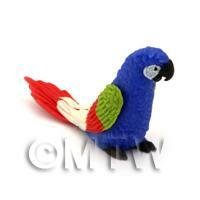 Product ID: 7817 Beautiful miniature blue parrot with green, red and white wings handmade from coloured air dried flexible clay resulting in each bird being slightly different and unique.We have a wide selection of chickens, cockerels and parrots in this range to leave you spoilt for choice. 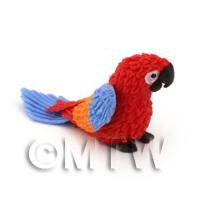 Product ID: 7819 Beautiful miniature red Parrot with red, green and blue wings handmade from coloured air dried flexible clay resulting in each bird being slightly different and unique.We have a wide selection of chickens, cockerels and parrots in this range to leave you spoilt for choice. 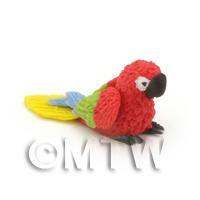 Product ID: 7820 Beautiful miniature red baby Parrot with red, green and blue wings handmade from coloured air dried flexible clay resulting in each bird being slightly different and unique.We have a wide selection of chickens, cockerels and parrots in this range to leave you spoilt for choice. 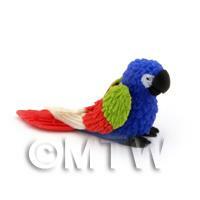 Product ID: 7822 Beautiful miniature red baby Parrot with blue, orange and red wings handmade from coloured air dried flexible clay resulting in each bird being slightly different and unique.We have a wide selection of chickens, cockerels and parrots in this range to leave you spoilt for choice.